A fragrance from Loewe inspired by the essence of youth. Fresh fruity notes capture insolence, freedom and fun, with a vanilla musk base for a touch of sensuality. The notes feature strawberry, pear, mandarin orange, magnolia, pink pepper, raspberry, sandalwood, vanilla and musk. 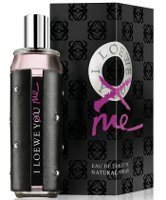 Loewe I Loewe Me is available in 50 or 100 ml Eau de Parfum, and can be found now at Harrods in the UK. Yes, I think the whole range (I Loewe You & I Loewe You Tonight) were also geared towards young people. Too bad about the ad — I didn’t see it, but have really liked many of their television ads. Oh it wasn´t THAT bad… maybe too lets say lighthearted and bit pretentious …like any teenager saying things (or wearing certain clothes and make up) that is written by some copy with a wrong sense of modernity. These are clever & well-done. They’ve stuck in my mind long after I’ve forgotten many others.